SpaceX successfully launched the seventh of eight planned missions for Iridium Communications from California’s Vandenberg Air Force Base at 04:39 Pacific Time (11:39 UTC). The launch which took place in foggy conditions and high wind shear over the booster recovery zone, yet the first stage still managed to successfully land on the drone ship. A challenging attempt to recover a fairing on Mr. Steven was unsuccessful. Wednesday’s launch was the first time SpaceX has attempted both a landing of the first stage and recovery of the payload fairing via “catcher” ship Mr Steven on the same mission. This was also the first West Coast mission in eight months to see a first stage recovery attempt – as the last four launches from Vandenberg had all been flown expendably – using flight-proven boosters that would not be suitable for any further flights. The payload for Wednesday’s mission consisted of ten Iridium-NEXT communications satellites, bringing the total number of these satellites launched by Falcon 9 up to sixty-five. 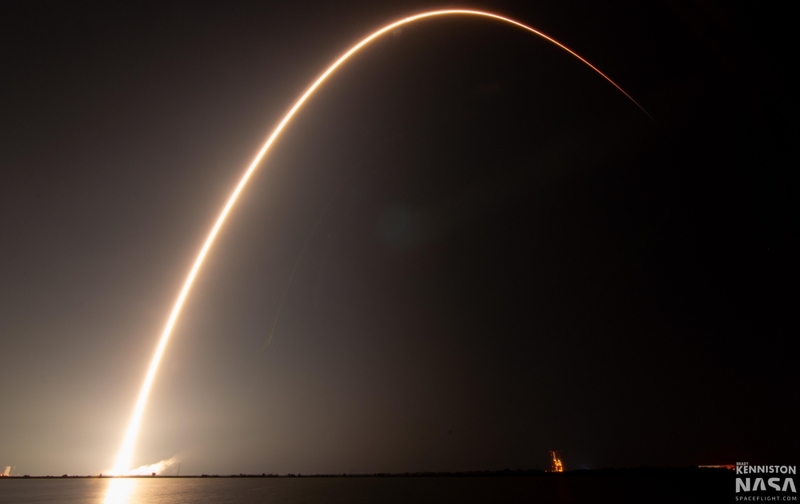 Iridium Communications booked eight launches with SpaceX to deploy their entire second-generation satellite constellation, with seven of these missions carrying ten satellites apiece – the eighth, a rideshare with the Grace Follow-On Earth science satellites, carried five Iridium satellites. 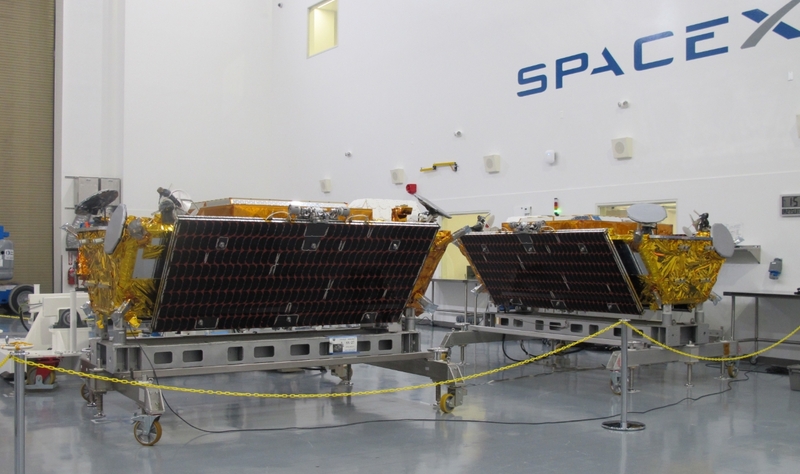 The Iridium-NEXT spacecraft are a wholesale replacement for Iridium’s aging fleet of satellites, most of which were deployed in the late 1990s and have been in service for over a decade past the end of their design lives. The first-generation Iridium satellites were deployed on behalf of Iridium SSC – a startup venture bankrolled by Motorola aiming to provide a worldwide satellite-based mobile telephone service, using satellites in low Earth orbit to avoid the lag associated with geostationary spacecraft and reduce the size of antenna needed by the user to communicate through the satellites. A drawback of this plan was that the entire satellite constellation needed to be in orbit before the company could begin offering service, with initial plans requiring seventy-seven satellites to ensure worldwide coverage. This was reduced to sixty-six (with six planes of eleven spacecraft). However, the name Iridium – chosen because the chemical element Iridium has seventy-seven electrons orbiting its nucleus – was retained. This led to a very high setup cost – on the order of five billion US dollars – before Iridium could begin making money from customers. The high initial outlay led to Iridium’s services being offered at a higher cost than cellular-based competitors, and despite the use of low orbit satellites the company’s handsets were still heavier and bulkier than regular mobile phones of the day. Because of this, customer uptake was much slower than expected and in 1999 Iridium SSC filed for bankruptcy. Time Magazine would later describe Iridium’s collapse as one of the “ten biggest tech failures of the last decade”. In 2001, with the constellation already in orbit, a new company was able to purchase Iridium SSC’s assets – including the satellites – for a fraction of what Motorola and Iridium had paid to develop the network. This new company would become the present-day Iridium Communications. The first-generation satellites were built by Lockheed Martin, using the LM-700A satellite bus, which had a design life of eight years. Launches took place between 1997 and 1999 via a total of twenty Delta II, Proton-K/DM2 and Chang Zheng 2C/SD rockets, followed by two replenishment launches in 2002 – one via a Delta II and the other a Rokot/Briz-KM. No replacement satellites were launched after 2002 until the first Iridium-NEXT satellites began to be deployed early in 2017. 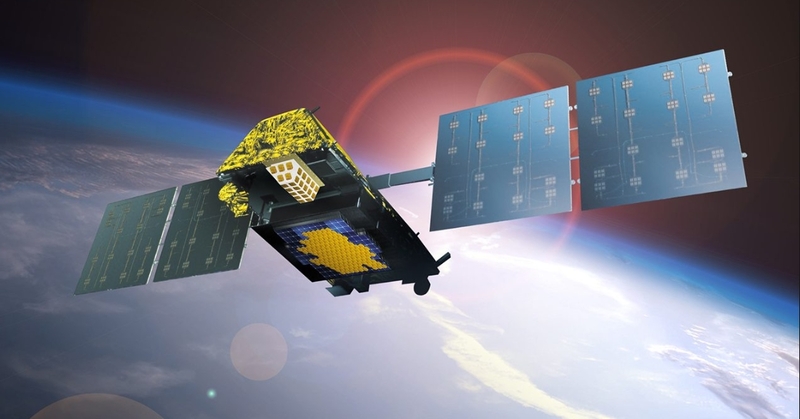 Iridium ordered eighty-one second-generation Iridium-NEXT satellites from Thales Alenia Space in June 2010, with the first launch then scheduled for early 2015. The order covered sixty-six operational satellites and spares – some of which would be placed into orbit and others which would remain on the ground ready to launch as and when necessary. Prior to Wednesday’s launch, fifty-five Iridium-NEXT satellites were in orbit. Based around the Extended Lifetime Bus, or ELiTeBus 1000, platform, each satellite has a mass of 860 kilograms (1,900 lb). While Thales Alenia Space is the prime contractor for the spacecraft, final integration is being conducted in the United States by Northrop Grumman, who acquired the production line in their recent merger with Orbital ATK. Iridium-NEXT satellites have a design life of ten years, but Iridium expects to be able to operate the spacecraft for at least fifteen. The communications payload aboard each satellite consists of L-band transponders to communicate with consumer devices and terminals, and Ka-band transponders to provide uplink and downlink to ground stations and crosslinks with other satellites in the constellation. The crosslink capability allows each satellite to relay data to the spacecraft immediately ahead of and behind it in the same orbital plane, and to the two satellites parallel to it in adjacent planes. This allows calls to be routed around the network in space, without needing to bounce them through ground stations, which reduces operating costs and improves the latency of the user’s connection. Iridium has set aside about 50 kilograms of mass on each satellite to host secondary payloads for partner organizations. These include Automatic Dependent Surveillance Broadcast (ADS-B) receivers to relay tracking data from aircraft, allowing flights to be tracked worldwide, including over the seas and remote areas of land. The ADS-B receivers, present on all Iridium-NEXT satellites, are operated by Aireon LLC, which was formed as a partnership between Nav Canada, the operators of Canada’s civil air navigation system, and Iridium. Most of the Iridium-NEXT satellites are also equipped with exactView-RT Automatic Identification System (AIS) receivers provided by exactEarth, which collect tracking data from ships at sea. The exactView-RT payloads are intended to provide real-time worldwide tracking of ships on the high seas, which previously would have been beyond the range of shore-based receivers. Wednesday’s launch was the second mission for SpaceX in a little over three days. Like Sunday’s successful launch of the Telstar 19V satellite from Cape Canaveral, the Iridium launch used a newly-manufactured Block 5 Falcon 9 v1.2. A two-stage rocket, Falcon 9 has been used for all of the Iridium-NEXT launches to date. Wednesday’s mission marked the fifty-ninth flight of the single-core version of Falcon 9 – the three-core Falcon Heavy has also flown once. The v1.2 version of Falcon 9 was introduced in December 2015 as a further upgrade over the v1.1, which had itself replaced the original Falcon 9 a year and a half previously. Within this version, SpaceX has continued to make incremental improvements with each block of vehicles, with Block 5 intended to be the final revision of the Falcon 9 design. This allows NASA to human-rate the vehicle for future Commercial Crew missions to the International Space Station, while SpaceX will turn its attention to developing the Interplanetary Transportation System (ITS) and “Big Falcon Rocket”. The Block 5 vehicle, making its third flight with Wednesday’s launch, is also intended to allow the rocket to be reused many times, with short turnaround times between flights, unlike previous versions of the booster that could only fly twice at most. 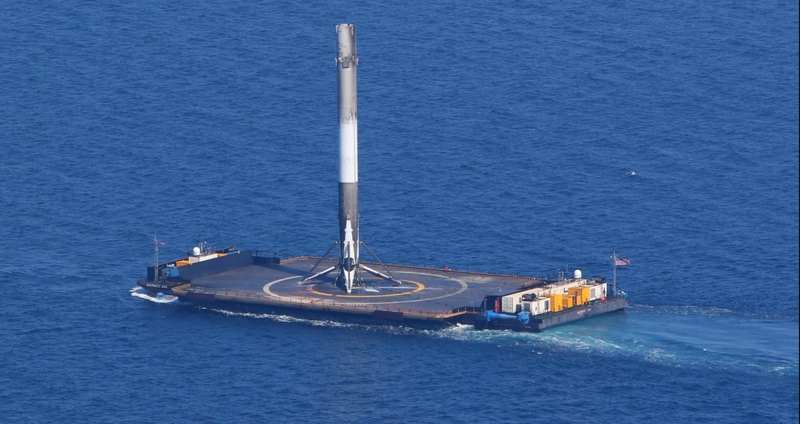 Falcon 9 first flew in June 2010. SpaceX developed the rocket to offer lower-cost access to space – aiming to achieve this in part by reusing as much of the rocket as possible. While initial experiments with using parachutes to recover Falcon’s first stage proved unsuccessful, a series of upgrades and revisions to the Falcon 9 have increased performance, enabling the rocket to carry heavier payloads while also allowing its first stage to make a powered descent back to Earth after completing its role in the ascent. 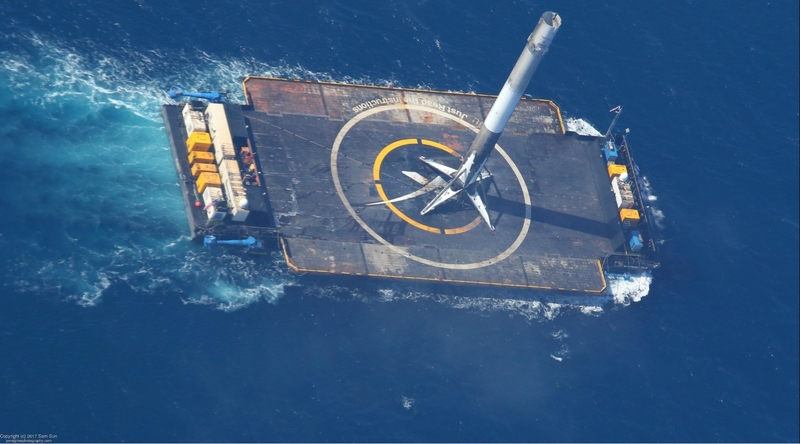 To aid recovery, Falcon’s first stage is fitted with stabilizing grid fins and landing legs, which deploy shortly after the stage separates and just before landing respectively. The stage – also known as a Booster or Core – makes two or three burns after separation, depending on its flight profile, before landing either aboard an Autonomous Spaceport Drone Ship at sea or at a dedicated landing area on land close to its launch site. On Wednesday’s mission, SpaceX aimed for the ASDS, named Just Read the Instructions, stationed downrange in the Pacific Ocean. Just Read the Instructions is the second SpaceX Drone Ship to bear this name – which was also used for the original East Coast barge used for two missions in 2015 before it was replaced with Of Course I Still Love You. The vessels are named after ships in the Culture series of novels by Scottish author Iain M. Banks. Just Read the Instructions was last used last October to recover the first stage of a Falcon 9 that launched the third group of Iridium-NEXT satellites. The four Falcon launches from Vandenberg since then have all expended the rocket’s first stage, including Iridium’s fifth mission in March which re-used the booster from the October launch. In support of Wednesday’s launch, Just Read the Instructions left the port of Los Angeles on Sunday night, towed by the tug Pacific Freedom. The drone ship will be positioned downrange at the same coordinates it occupied for the third Iridium mission last October. As well as recovering the first stage, which SpaceX have already achieved considerable success with on previous missions, Wednesday’s launch also saw another attempt to recover the rocket’s payload fairing. This structure, which composes the nose of the rocket, protects the vehicle’s payload from Earth’s atmosphere during the early stages of flight. Once Falcon 9 reaches space, the fairing splits into two pieces which are discarded, reducing the weight of the vehicle and exposing the payload for eventual deployment. By recovering and reusing the payload fairing, SpaceX aims to save a further six million dollars per launch. To achieve this, the two halves of the payload fairing have been fitted with parachutes to slow their descent. While SpaceX has already demonstrated that the fairing can land intact in the ocean under parachute, the salt water contaminates the fairing, preventing it from being reused on future missions. Instead, SpaceX has equipped a boat – named Mr Steven – with a giant net that it will maneuver underneath the halves of the fairing as they descend. SpaceX is yet to catch part of a fairing in the net successfully, however ahead of Wednesday’s launch the size of the net had been increased. 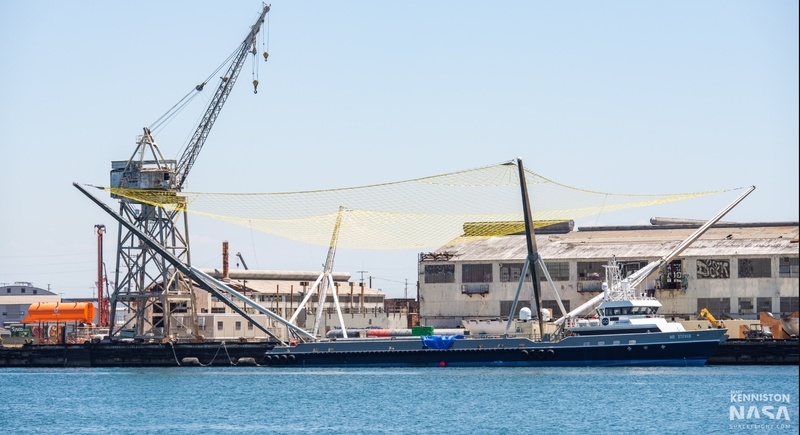 It remains unclear whether Mr Steven is capable of catching both halves of a fairing, or whether a second ship will eventually be required on each coast for operational recoveries. The strong wind shear over the recovery area was classed as extra challenging and resulted in an unsuccessful attempt to catch the fairing. Like all of SpaceX’s missions for Iridium Communications, Wednesday’s launch took place from SpaceX’s West Coast launch pad, Space Launch Complex 4E (SLC-4E) at California’s Vandenberg Air Force Base. Built as part of the US Navy’s launch site at Point Arguello, SLC-4E was originally designated Launch Complex 2-4 and entered service just after Point Arguello was merged into Vandenberg Air Force Base in August 1964. The pad was used by Atlas-Agena rockets from 1964 to 1967, and by Titan IIID and IV vehicles from 1971, ending with the final flight of a Titan rocket in October 2005 by a Titan IV(404)B. The designation Space Launch Complex 4E came as part of a renumbering of Vandenberg’s launch pads in 1966. SLC-4E was one of two launch pads in Space Launch Complex 4, with SLC-4W having also initially been used by Atlas-Agena, followed by smaller members of the Titan family – the Titan IIIB and Titan II(23)G.
SLC-4W is no longer a launch complex, but has instead been converted to serve as SpaceX’s West Cost Landing Zone for Falcon 9 boosters. 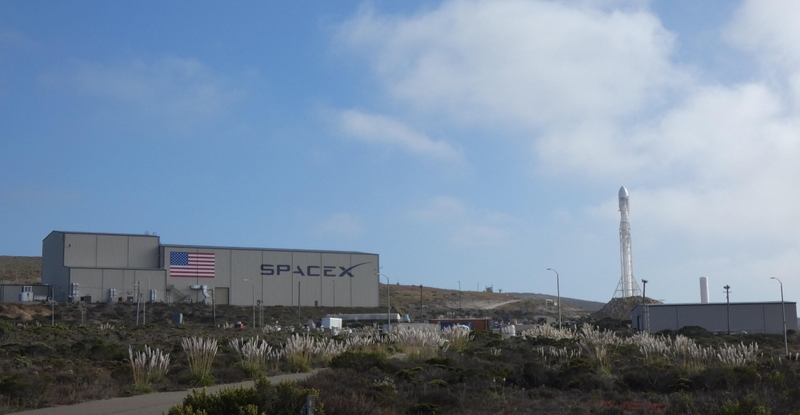 SpaceX is expected to attempt their first return-to-launch-site recovery at Vandenberg in early September. Fuelling of the Falcon 9 rocket in preparation for Wednesday’s launch began at the T-35 minute mark in the countdown, following approval from the Launch Director which was given three minutes before tanking is due to start. RP-1 kerosene propellant was loaded into both stages of the rocket and supercooled liquid oxygen began flowing into the first stage oxidizer tanks. Oxidizer loading for the second stage – which also uses liquid oxygen – began at the 16-minute mark in the countdown. In the final minutes of the countdown, Falcon underwent a series of checks to ensure it was ready for launch while the final preparations for the flight were ongoing. Seven minutes before liftoff chilldown of the first stage engines began, and at the four minute mark the strongback – a structure used to transport the rocket to the launch pad, erect it and provide umbilical connections, began to rotate back away from the rocket. Vandenberg uses an older design of strongback to SpaceX’s other launch sites, with the strongback completing its whole retraction sequence ahead launch, instead of retracting partially and then falling away at T-0. In the last minute of the countdown, Falcon’s tanks were brought up to flight pressure and the onboard computers began their final checks before launch. With about forty-five seconds to go, the Launch Director gave the final “go” for launch. Falcon 9’s first stage, Core 1048, is powered by nine Merlin-1D engines. Igniting about three seconds before the countdown reaches zero, these engines provide the thrust that will carry Falcon away from its launch pad. Liftoff occurs at T-0, after which the rocket will begin to climb – vertically at first – before pitching over to head downrange. Seventy-two seconds after liftoff, Falcon 9 passed through Max-Q, the point at which the combination of acceleration and atmospheric density subject the vehicle to the maximum aerodynamic pressure that will experience in flight. The first stage powered Falcon’s ascent for the first two minutes and 24 seconds of flight, before the mission reached an event designated main engine cutoff (MECO). The nine Merlin engines shut down and three seconds later the first stage separated. About two seconds after separation, while the first stage reoriented itself, the second stage ignited its single engine for the first of two planned burns. Falcon’s second stage is powered by a modified Merlin-1D, designed to provide optimal performance in the vacuum of space. This Merlin Vacuum (MVac) engine burned for six minutes and four seconds to reach an initial parking orbit. The rocket’s payload fairing separated from the nose of the vehicle 42 seconds after second stage ignition, beginning its own journey back to Earth – and hopefully to the net of Mr Steven. While the second stage powered its way towards orbit, Core 1048 performed its own series of burns as it targetted landing aboard Just Read the Instructions. The first of these was a partial boostback, firing three engines shortly after stage separation in order to turn the stage back towards the waiting drone ship. This burn allows the recovery to be made closer to shore than if the drone ship positioned itself to catch the booster on its existing trajectory – as it does on East Coast geostationary missions where the rocket does not have sufficient fuel for a boostback burn. Following the boostback and deployment of its grid fins, the next event for the first stage was its entry back into Earth’s atmosphere – accompanied by an entry burn to reduce its velocity and limit heating – about three minutes and 12 seconds after separation. About a minute after reentry the stage began its landing sequence, igniting a single engine and extending landing gear to achieve a powered touchdown aboard Just Read the Instructions. Landing is came around seven minutes and 17 seconds mission elapsed time. The second stage concluded its first burn about a minute and a quarter after first stage landing, an event designated second stage engine cutoff 1 (SECO-1). 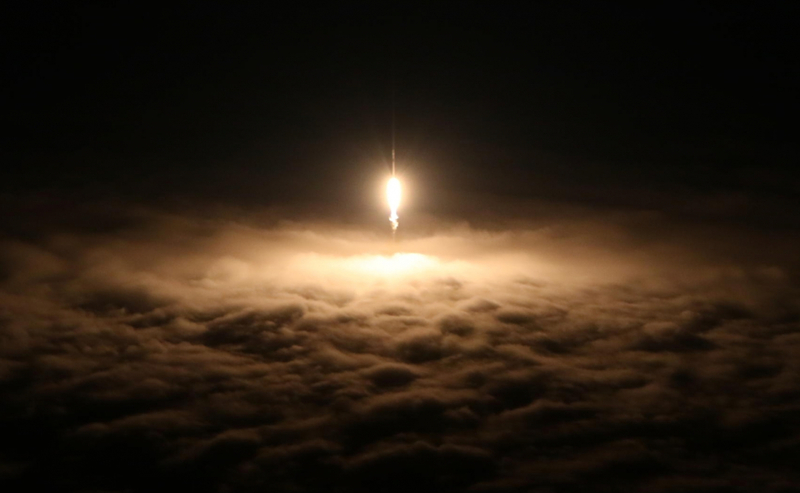 After cutoff, the rocket coasted for 42 minutes and 55 seconds to reach the proper position to fire its engine again in a nine-second orbit circularization burn. This burn ended with second stage engine cutoff 2 (SECO-2), and separation of the ten Iridium-NEXT satellites began five minutes and one second later. The deployment process lasted around 15 minutes, with each spacecraft separating in turn. After the final satellite deployed, the second stage restarted for another burn, deorbiting itself into a corridor over the Antarctic and southern Pacific oceans. With Wednesday’s launch, Falcon 9 overtook Boeing’s (now United Launch Alliance’s) Delta II as the rocket that has launched the largest proportion of Iridium’s satellites. Delta II deployed the lion’s share of the original Iridium constellation, carrying sixty satellites into orbit in twelve groups of five. Wednesday’s flight was the penultimate mission of SpaceX’s contract with Iridium Communications, with the final launch currently expected in late September or October. Following October’s launch, Iridium will have seventy-five new-generation satellites in orbit, with a further six remaining as ground spares. 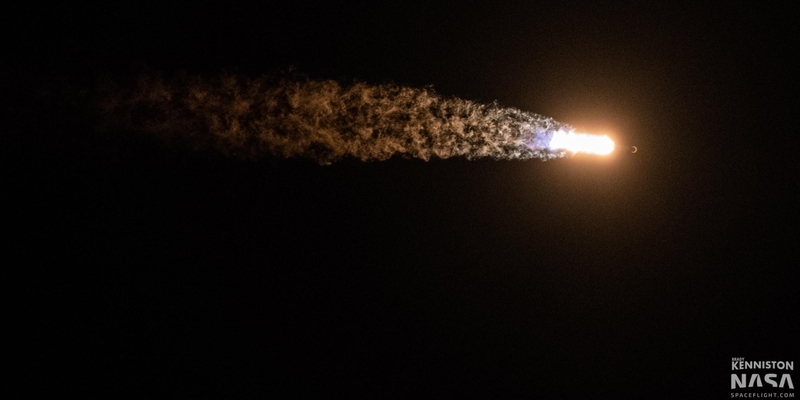 The company has not yet announced how they will launch these satellites should they be needed on orbit – Iridium had originally planned to use ISC Kosmotras’ Dnepr rocket, which has since stopped flying as a result of the political situation between Russia and Ukraine. Before carrying out its final Iridium launch, SpaceX will conduct several missions from both Cape Canaveral and Vandenberg. Falcon 9 will be in action again next Thursday to deploy the Telkom 4 satellite for Indonesia, with its next West coast launch slated to be that of Argentina’s SAOCOM-1A satellite on 5 September.